Think you lose any stored transfers after using your free hit so you’ll only have 1 FT after. My advice is to make a transfer in prep for later weeks then activate free hit. Actually, others below saying that using free hit cancels any transfers that week, even if you do it before activating. So plan for only having 1 ft after. “... Make 3 transfers for -4 & use BB - DGW35 ...”. Chip and FTs together? Typo or error? What's the consensus on Wolves options? Yeah I’m not convinced by any of them. He loves to rotate and surely will. Was thinking to keep Jiminez, but not so sure now. Think I'll avoid, maybe get Zaha instead. If I do Salah to Mane tonight and then activate FH chip, that transfer will be cancelled in gw33? Yes salah to mane would get cancelled out if you activate FH this GW. There is a way which I can see last season GWs? Oh, I don't know, sorry. When will we know officially the added matches in 32? TBC Brighton v Cardiff for 33,34,36 or 37. Progression in Europe means 33/34 QFs and 36/37 SFs are not options for DGW for these elite teams. Best non-Palace def for 4.6m? Is it possible to make a GW 32 transfer and then use your free hit? That way you'll end up keeping the transferred player in. Means I get Salah back for 33, yay! So in other words it won't count? Thanks for clearing it up. Post your bad gameweek scores here. Had a complete failure of a gw. 10 players. Double pool def (since five weeks back) and Salah, no Mane. Hazard. Wilson. All failed. Anderson only return. On 24 -8. 16 points. Goodbye top 40k, which I was in before this. Blank central for my team....with the exception of Anderson and McNeil! Funny how they were probably the only two I wasn't happy with going into the weekend. 25 (-12) - I took a late hit from Alonso -> Luiz - complete Meh!!! Any rises tonight I should catch whilst I'm using WC? Thinking of dumping Robbo for DLuiz/Shaw/Lindelof in case they rise. Will be making the transfer for one of the three anyways. Thoughts on this free hit 32? Mid/fwd looks great, not sure on Kepa. On my FH.... How does this look? I had a decent team on paper. Had 11 playing on a -4. 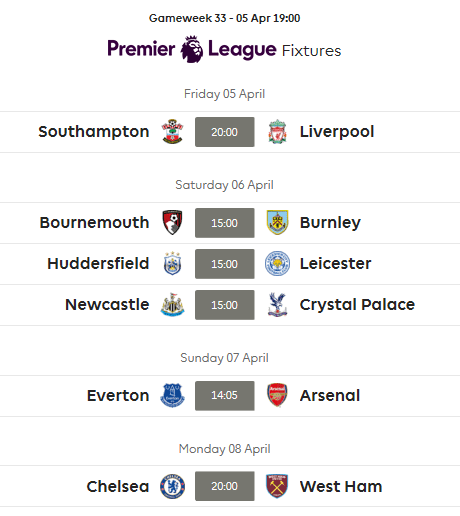 If you think about what it feels like for a casual who wouldnt know about all the extra information out there on sites like this, twitter etc, its a big joke how FPL handles the double game weeks. We are not even one game week away and theres still no indication in the official game that there will suddenly pop up ~6 extra games. Could do with a few ideas thrown at me for my next FT. I have £1m itb, and I’m seeing Salah, Hazard and Button as my biggest issues. What would you advise with this lot? If I ya the free hit now can I chop and change as many times as I want before the deadline passes? Feeling like my decision to free hit this gwk could well pay off ! You will always only have 1ft in 33 and your team will always revert back to what your team was at end of 31, regardless of when you played your fh. GW 32 Free hitters....is now the time to press the button, or is it best to wait until after the international break? Technically it is probably 0.01% better to press it later, but the risk of me forgetting to press it is probably 0.05%, so I've just pressed it.